En prise does not mean ‘in take’ because ‘in take’ does not mean anything. Nor can it be regarded as indicating a unit (defended or undefended). ‘In taking’ and ‘unprotected’ are as inappropriate as Brady’s pronunciation guide (since prise rhymes, more or less, with ‘keys’). The word ‘unintentionally’ was then disputed by W.H. Cozens but defended by a contributor to the Encyclopedia, Wolfgang Heidenfeld. (For their discussion, see the BCM, September 1978, page 402; April 1979, page 175; July 1979, page 311.) 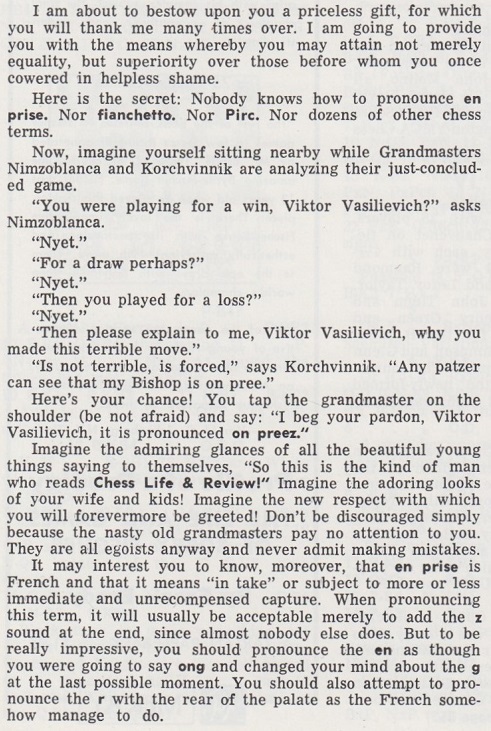 After all that, Golombek dropped ‘unintentionally’ from the paperback edition of his Encyclopedia, although the word (and much else besides) was the subject of an unwise reprise in Nathan Divinsky’s desperate and desperately imitative 1990 volume The Batsford Encyclopedia of Chess. 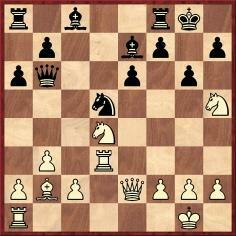 (Leaving his knight at h5 en prise, White puts his other knight en prise to two pawns.) 16 Nf5 exf5 17 Rxd5 Bg5 18 Rad1 gxh5 19 Rd6 Qc7 20 Qxh5 Qe7 21 h4 Bf4 22 Bf6 Qe4 23 g3 Be6 24 gxf4 Qxf4 25 R6d4 Resigns. Source: Tidskrift för Schack, April 1930, pages 80-81, which gave the game with brief notes by G. Stoltz. The mispronunciation of en prise seems particularly prevalent in United States sources, as a web search for ‘on pree’ will show. As regards chess books, the most recent occurrence of this error that we have seen is on page 167 of Portable Chess Coach by Judee Shipman (New York, 2006).